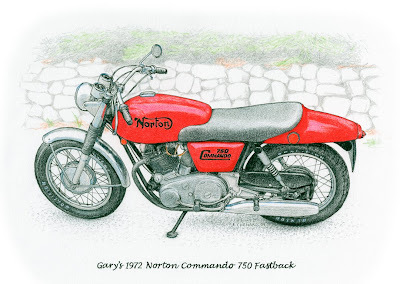 Recently, a friend of mine commissioned me to illustrate her husband's 1972 Norton motorcycle as a gift. Pen & ink and Prismacolor pencils on white archival stock 12"x 9"
It was a fun project, and I guess it solicited the required response. I really like that motorcycle and you did a great job with the illustration. What a cool gift idea for your friend's husband! !